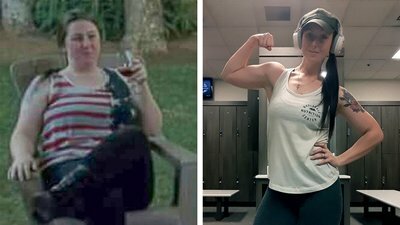 Samantha Tuohy Started Lifting And Took Control Of Her Life! This personal trainer used to be a smoking, drinking, eating machine. Now, she's just a machine. Bad habits like smoking, poor eating, and a lack of exercise followed Samantha Tuohy into adulthood. By the time she was 25, she weighed 225 pounds, suffered from clinical depression and anxiety, and was struggling with infertility. After an eye-opening visit to the doctor, she resolved to change the way that she was living. She strung one quality workout after another, one Bodybuilding.com program after another, and one healthy meal after another. It took time, but she was patient. Today, Tuohy is a NASM-certified personal trainer and 85 pounds lighter than when she started. Age: 25, Height: 5' 9", Weight: 225 lbs. Age: 29, Height: 5' 9", Weight: 140 lbs. Between the ages of 22 and 25, I put on a ton of weight. My life consisted of heavy drinking, smoking cigarettes, eating poorly, and doing no physical activity at all. During this time, I was also diagnosed with depression and anxiety disorders. I knew that I was heavier than I wanted to be, but I didn't want to see a number connected to my weight. So, I avoided scales until a doctor's appointment in late 2013, when I was told that I weighed 225 pounds. I couldn't believe it. I also learned that my unhealthy habits were causing damage to my ovaries and uterus. I wanted to start a family, and this was really difficult to hear. My depression buried me for a while. When I surfaced, I knew I had to change. How did you get started on your transformation? Like a lot of people, I started improving myself through a New Year's resolution. To start, I smoked my last cigarette on January 1, 2014. After a month without a cigarette, I felt unstoppable! The next month, I started to exercise regularly. At first, I was just doing home workouts, but it was enough to get me started. The third month, I realized that my diet needed to change as well, so I took on that challenge and stopped eating a lot of unhealthy foods. After a few months, my husband decided to join me. We got gym memberships together, and then we were hooked! I lost 85 pounds in 10 months. Then, I found another goal to work on: I wanted to build muscle. That's where Bodybuilding.com came in. My husband recommended the site to me and I started using some of the programs to get stronger, and train like the women and men I was seeing online. How did lifting change your life? Today, my life is drastically different! This journey has been so humbling, and working out has made everything in my life better. My marriage is better, my mental health is good, and my life is, all-around, really great! Once I transformed my life, I stopped any further reproductive damage from happening, too. Now, I am able to focus on a big goal of mine: having a family of my own. How did you stay on-track with your goals? I used a calendar, crossing off the days that I worked out. Whenever I felt like quitting, I would look at the calendar and see all the days I'd already crossed off. That motivated me to keep going. I also used social media to hold myself accountable. I would post every completed workout online, and I found a lot of inspiration by reading other people's success stories or following other fitness enthusiasts. What diet plan helped you transform? I started out on a keto diet when I first got into regular exercise. That means lots of fat and protein with very little carbs. For me, the keto diet was something that helped during the weight- loss phase. Now that I'm trying to put on more muscle, I do more of a carb-cycling approach. On cardio days, I eat fewer carbs and more fat and protein. On lifting days, I try to get more carbs and protein, but fewer fats. Every morning, I start off with a whole- wheat bagel and cream cheese within the first 30 minutes of waking up. I also try to eat at least 3three eggs a day for lots of good fat and protein. My go-to fruit is the banana. It's got lots of potassium and carbs when I need them. What kind of supplements helped you transform? Cellucor SuperHD fat burner: in the morning and before workouts. What training regimen kept you on track? Monday: Cardio on the stairmill for 45-60 minutes to an hour. Tuesday: Upper-body workout consisting entirely of supersets. Wednesday: Cardio on the stairmill for 45-60 minutes to an hour. Thursday: Leg day: I switch it up a lot as far as exercises go, but I still do all supersets. Friday: Cardio on the stairmill for 45-60 minutes to an hour. This is going to sound crazy to some people, but I don't feel like my physical transformation was met by many challenges. I understood from the beginning that it was going to be a very long process. Once I lost the first 10 pounds, I knew that I was on the right track and just had to keep doing what I was doing. If anything, I would say that the biggest challenge has been an emotional or spiritual one, from outside of the gym. One of my biggest goals in life is to be a mom, but after doing a few tests I was diagnosed with a blocked fallopian tube. This was possibly caused by my earlier, unhealthy habits. Even though there won't be any further damage, I still have trouble with infertility. I'm on a treatment routine right now that consists of giving myself injections every night and going to lots of doctor's appointments for ultrasounds and blood work and a lot of other stuff. It's more of an emotional roller coaster than anything. But, I'm mentally stronger, physically stronger, and spiritually stronger than before my transformation, so I know that I'll make it through this. One day, I'll be a mom. I recently became a certified NASM personal trainer, so I would say that my main goal right now is to help motivate other people to achieve the kind of transformation that I've had. I want to make sure that other people know that they can have the same success story that I did, if not a greater one! Do you have any suggestions for aspiring transformers? Absolutely. Start by understanding that this is a process. You won't transform overnight. If you can really understand that now, then this will all be easier than you think. Wake up every day, look in the mirror, and say aloud to yourself "I can do this! It's going to take time, but I can do this!" You must believe this mantra! Positive self-talk is absolutely necessary to keep yourself on track toward achieving your goals. If you have a bad workout, just accept it and do better the next day. Keeping a good attitude is the key to staying out of a funk! Once I had achieved my weight- loss goals, I was ready to put on muscle. The training programs on Bodybuilding.com helped me get started on that path. I loved how every program I used had tutorial videos and how it broke down the workouts into a routine for each day. Thanks to Bodybuilding.com, I always knew what to do when I walked into the gym. This gave me the confidence to work hard when I would wentgo into the weight room. The specific programs that helped me along the way were Arnold Schwarzenegger's Blueprint to Cut, Dymatize Transformed, and Kristina Olson's program from her Fitness 360 profile.